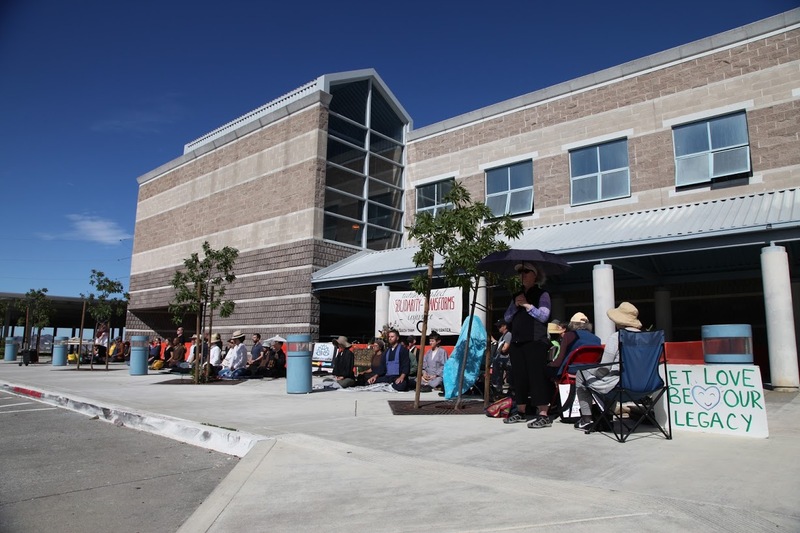 Good morning and Welcome everyone to our vigil and service here at the West County Detention Center in Richmond hosted today by Green Gulch Farm Zen Center. I want to thank Rev. Deborah Lee and everyone at the Interfaith Movement for Human integrity for welcoming us today and for their commitment to this monthly vigil. Green Gulch Farm Zen Center, also known as Green Dragon Temple, a part of San Francisco Zen Center, is a Zen Buddhist meditation and retreat center, and an organic farm and garden, in Marin County near Muir Beach. GGF was established 46 years ago to offer an environment of peace and calm, to teach and practice meditation and ways of living and working together with awareness and kindness, in a full response to our world. Everyone is welcome to visit us and join in our programs. Compassion whose heart is wisdom benefits all who receive it, all who give it, and all who simply witness it. When compassion is abandoned, when suffering and the causes of suffering are increased, when unspeakable harm is done to children, families, community members and those in need, we feel and experience heart-breaking grief. And those who withhold compassion and inflict injustice and harm—in our names—are affected as well. The depth of our grief is the height of our love for one another. 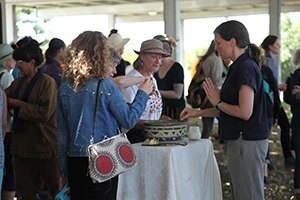 Our practice is not to turn away from suffering—not to ignore or distract ourselves—rather to feel the pain that we feel—knowing this pain itself as our true interconnectedness—as our caring for each other—Calling on our compassion we bring forth this love and respond together in solidarity with creative actions of integrity. 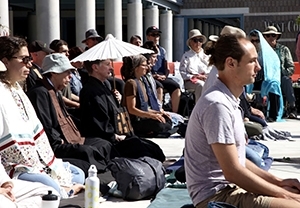 Attendees sitting zazen as part of the vigil. Attendees offering incense at the vigil. Attendees sitting and standing with signs at center.